Hear Ye! Hear Ye! 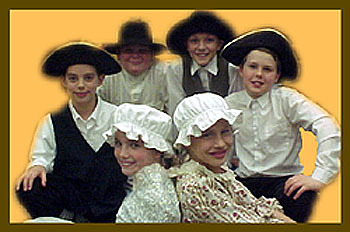 Word has been sent that there is a group of colonists sailing to our new land as we speak! They are coming in search of new ideas, new freedoms, new life, but most importantly NEW HOMES!!! And that of course means new business to our workers here at Colonial 13 Realty. Take a good look at some of these new colonists, ladies and gentlemen! These are our newest clients. We have been hired to find them the very best location to build their new settlement. This job is huge, since they are not even sure whether they want to settle in the New England Colonies, the Middle Colonies or the Southern Colonies. So, you may work in groups of three to make sure that these colonists get a really clear picture of life in each of the regions. The job of each team member is to research different aspects of life in the region you are assigned. You will report your findings to your teammates. So, get ready to... Show Me the Colonies!!! In your notebook, tell which region you are assigned to (New England, Middle, Southern). DRAW your region of colonies, LABEL the names of the colonies in your region AND their capital cities. A "trade" is another word for a job. In your notebook, NAME 5 jobs the colonists may choose to have and DESCRIBE what each job is.